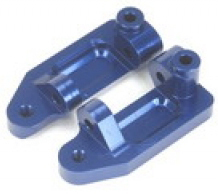 Aluminum Caster Blocks for Stampede/Rustler/Slash 2WD (Blue) Discounts Apply ! SPTST3632B - Aluminum Caster Blocks for Stampede/Rustler/Slash 2WD (Blue). Using high quality CNC machined aluminum, these aluminum caster blocks greatly increase the strength of the front suspension of your car or truck while adding that factory look to your ride.